Every kid wants to laugh, but Max is the boy who can make it happen. Only now he's been forced to join the local ice-hockey team, and there's nothing funny about slipping over and getting a frozen bum. Or is there? Max is the funny kid ... and this time he's skating on thin ice! Epic fails, a wrestling rhinoceros called Roxanne, fake news, locker rooms filled with popcorn and the dreaded return of Mr Armstrong are just some of the things in store for Max and his friends in this brand-new Funny Kid adventure. 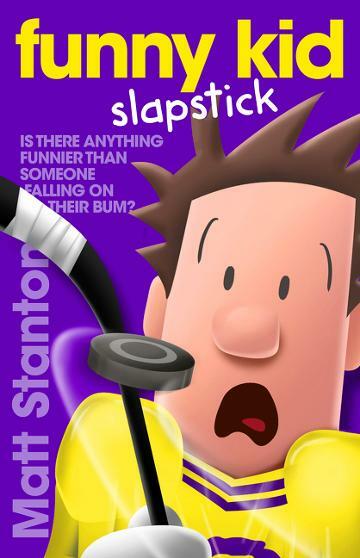 Matt Stanton is a bestselling children's author and illustrator, with more than half a million books sold. He is the co-creator of several bestselling picture books, including the mega-hits There Is a Monster Under My Bed Who Fartsand This Is a Ball. He launched his much-anticipated middle-grade series, Funny Kid, in 2017. The first book in the series, Funny Kid for President, debuted as the #1 Australian kids' book, and Funny Kid is fast winning legions of fans around the world. He lives in Sydney with his wife, bestselling picture book creator Beck Stanton, and their three young children.